If you have a digital TV, you may find that it has a CI slot, which is built to accept a CAM. On this page, we’ll explain what a CI slot and a CAM are, and how to use them. Until 2013, it was possible to watch ESPN by installing a CAM into your TV. IN 2013, ESPN was acquired by BT Sport, meaning that ESPN is no longer available for viewing with a CAM. What is a CI Slot? If you have a fairly new digital TV set, you may find that it has a slot somewhere, typically covered up with a blanking plate. If you remove the blanking plate, you’ll see that something can be slid into that slot. This slot is known as a CI slot, or Common Interface slot, and it’s designed to accept a CAM, which will allow you to get a subscription TV service, such as ESPN. The lovely lady to the right is modeling a CAM with a Top Up TV subscription card. The CAM is a small metal adapter, known as a Conditional Access Module that slides into the CI slot on a digital TV set. A CAM measures 10 x 5.5cm. The CAM has its own slot, into which you can slide a credit-card-sized subscription card. The upshot is that if you got a CAM and a subscription card, your TV would be able to watch extra content on a subscription-basis. What can I get with a CAM and CI Slot? 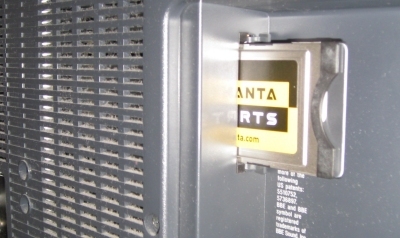 A few years back, you could use a CAM in your TV to watch Setanta Sports. 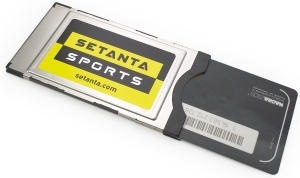 They were offering subscription to their Setanta 1 sports service to Freeview users for £9.99 a month – that was until they went bust in June 2009. Now, you can use a CAM to get the ESPN UK channel on a subscription basis. How do I get a CAM? If you have a CI slot on your telly and you want to sign up to a subscription service such as ESPN, then you need to get a CAM. When you have a CAM, you insert a viewing card into the CAM, then insert the CAM into your TV. Switch on the TV. The CAM should be automatically detected. It’s then a case of waiting for your card to be activated. With ESPN, the advice is to tune in to Channel 5 on Freeview, and stay on that channel for about 60 minutes to allow the card to receive its activation code over the air. No module? If you’re getting a “No module” message, chances are the module is either not inserted correctly, not suitable for your TV, or can’t be inserted correctly as the pins in the TV are damaged. Check that the pins are not bent or damaged. If you look at the bottom of the CAM, you will see two rows of holes – these push into two rows of pins on the TV. If the pins are bent, the card won’t connect properly (you may been a torch and mirror to see into the CI slot. From your digital TV set, go to the on-screen menu, and look through the various options. There should be a screen somewhere that allows you to confirm that the module is inserted, and check that the smartcard is present. It should also confirm the date of your subscription. See the screenshot below for an example. If it looks like your module still isn’t being recognised, you need to work out if the problem is with the CI slot in the telly, the CAM, or the card. One easy way to tell is to take your card and CAM to a friend / relative’s house and try them in their TV’s CI slot (if they have one) – This will let you work out where the problem is. f you’re still having no luck, it’s possible that you are not using the right type of CAM, or that your TV or set-top box doesn’t support the type of CAM or subscription card you’re trying to use. Q. Why does the CAM work for Sky Sports 1 & 2 in my PVR, but not in my TV? Our understanding is that there is currently a restriction imposed by Sky on the Top Up TV system. The restriction doesn’t seem to apply to ESPN, but does to Sky Sports 1 and Sky Sports 2. We understand that Sky does not approve of customers being able to use their subscription card in other equipment – probably to prevent people using their cards in other properties. Sky cards in Sky boxes have a similar restriction, where the subscription card is tied to a specific box. If you need to change your card so that it works in a different device, call Top Up TV and they may be able to arrange the switch for you. Q. Is the CAM a generic thing, or does it only work with a specific card? Q. I used to get Setanta Sports. Can I now get ESPN? After Setanta’s collapse in June 2009, Disney-owned ESPN took over some of the rights to key sporting events, such as Barclays Premier League and Clydesdale Bank Premier League football. ESPN’s UK channel started in August 2009 and is available to users with a suitable CAM and CI slot. If you have previously watched Setanta Sports with a CAM, you should be able to get ESPN. Your existing Top Up TV or Setanta Sports viewing card can still be used (you will need to call 08444 152020 to get it re-activated though. You can try the alternative number 01592 587200 which is slightly cheaper). Freeview Help – Need some advice on Freeview? The tv finds over 100 stations, including sky news which is what I am after and which is freeview. What does the cam and the ci do for the tv?? Hi,I’m Burundian(BURUNDI) in Central Africa have just bought TV-TECHNIKA 2nd Hand from UK and when i do press automatic research i find over 60 chanel. When I try to watch one of them on the tv I get the message <>. Where can-i buy that CAM modul and how much. Does CAM works everywhere or specific places. If it works everywhere, am in Ghana, where can i buy CAM and Card? I have an 7hyr old digital TV which does no have a cam. Is it possible to get a cam which will enable me to use my tv subscritpion card with this old TV? Am also in ghana wre can i get some to bye? Pls! It is amazing how unhelpful freeview are with their robot answering machine. Noone seems to know including panasonic what the ourpise of the card cam slot is on their freeview tv. Bad customer service from both. Is it possible to get CAM transmission in Nigeria, and where to get CAM to buy for my CI slot in Nigeria.